I have seen The Fight Oil Co on Instagram and they sell oils, balms & bath soaks for combat athletes. They contacted me asking if I would review some of their beard care products and of course I said yes! As their main focus is products to help combat athletes, I did wonder if the beard care products might to be up to scratch, it is wrong to pre judge like that but we all do it. I am happy to say that the Tengu beard balm is not only up to scratch, it is bloody amazing! The base is a blend of Shea Butter, Apricot Kernel Oil, Coconut Oil, Beeswax & Vit E. It is one of the smoothest balms I have used and despite the consistency, the balm very, very quickly melts in your palm. Now I have a wirey beard, but with The Fight Oil Co Tengu beard balm, my beard felt so damn soft, so soft that I kept running my hand through to feel it. Of course it also gives a nice hold and so will keep your beard looking tidy, which I ruined by constantly running my hand through my beard. The scent is a blend of Lemongrass, Star Anise, Pine & Tea Tree essential oils and the scent is so fresh and long lasting. It does smell like Lemon Sherbet sweets and I really like it! The Fight Oil Co products have all been assessed and approved and hold a CPSR (Cosmetic Product Safety Report). 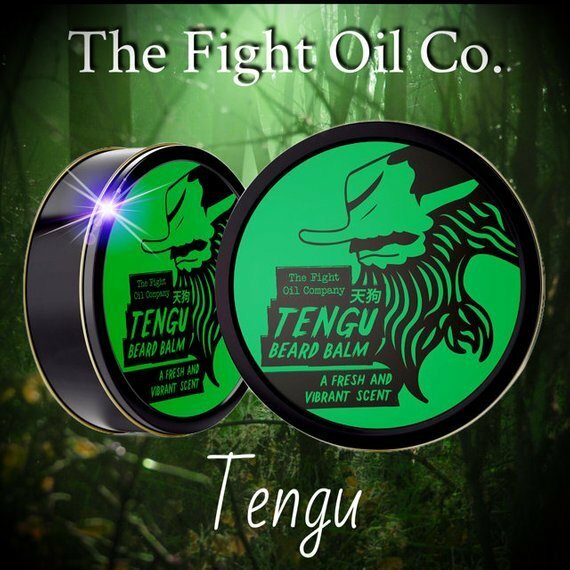 The Fight Oil Co Tengu beard balm comes in a 1oz (just under 30ml) screw top tin and currently costs £7.59 from their Etsy Shop or check out their offer where you buy 2 balms and get the 3rd free! You can keep up to date with The Fight Oil Co on Facebook, Twitter & Instagram.